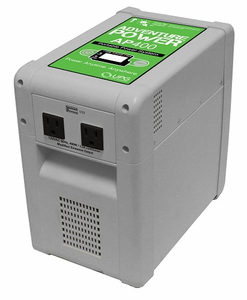 Have access to backup power in times of emergencies, during camping trips and during tailgating events with the UPG Adventure Power 400 Watt Portable Power System. With this solar-compatible portable power generator around, you can continually enjoy the comforts of your electrical appliances and devices during power outages. This solar compatible portable generator stores power from wall outlets and solar panels in a lead-acid 40Ah battery where consumer electronics can draw power from. This portable solar generator can supply power to up to 3 devices at once with its 2 AC receptacles and 1 USB port. And because it operates without emitting harmful gases, unlike traditional power generators, it can be safely used indoors. Dimensions (LxWxH): 10.5" x 6.26" x 10.25"
Q: How many devices can connect to the UPG Adventure Power 400 Watt Portable Power System? A: This solar powered generator has 2 AC receptacles and a USB port allowing up to 3 devices to connect to it at once. 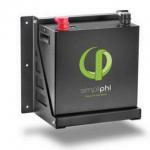 Q: What can I use to recharge this portable solar generator? 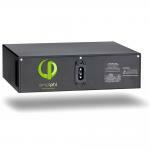 A: You can use a solar panel, like the UPG 80 Watt Solar Panel with Stand, to recharge this product. It also has a built-in AC charger that allows for recharging through AC outlets. Q: Does it come with a solar panel? A: No, this portable solar power generator does not come with a solar panel. A: It takes around 20 hours by AC power source and about 12 hours of direct sunlight with the UPG 80 Watt Solar Panel with Stand.